My plant-knowledgeable and extremely generous Katoomba friends harvested some Indigofera Australis for me recently, and I brought it home gleefully to experiment. They have regular access to a place where Indigofera Australis is growing plentifully and where it is native. 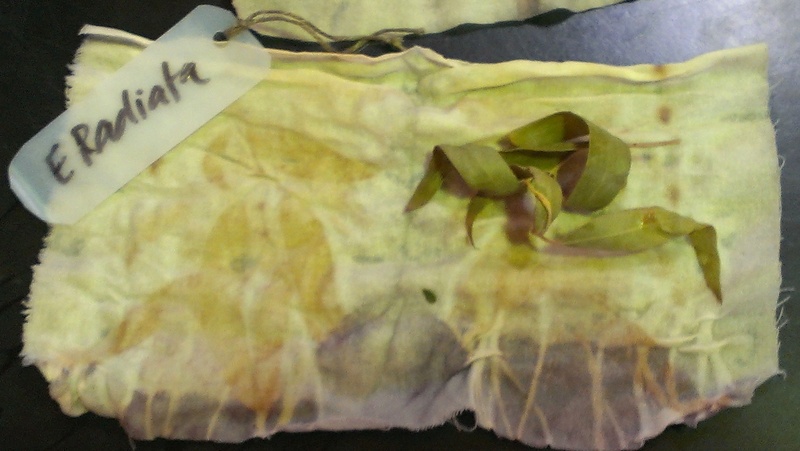 I had one previous opportunity to try dyeing with this plant and it was fascinating but completely unsuccessful. So, it was exciting to have another chance. 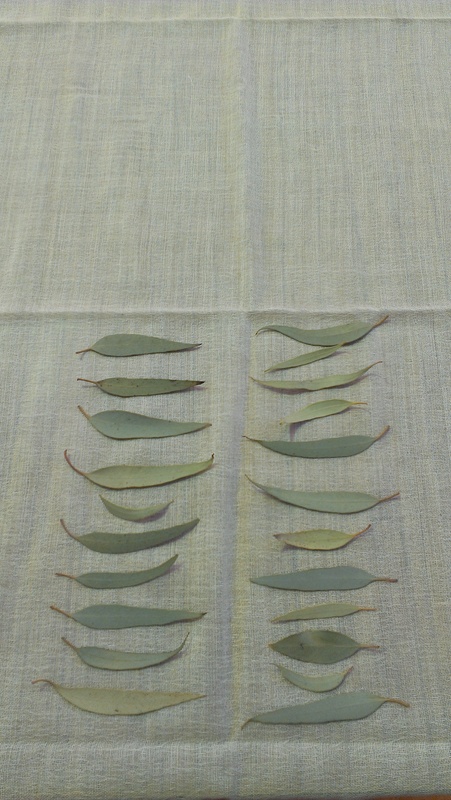 There were 112g leaves in my parcel once I stripped them from their branches. They had been kept cool or refrigerated in the 7-10 days since they had been picked–fresh but not really fresh. I decided to try two different methods. 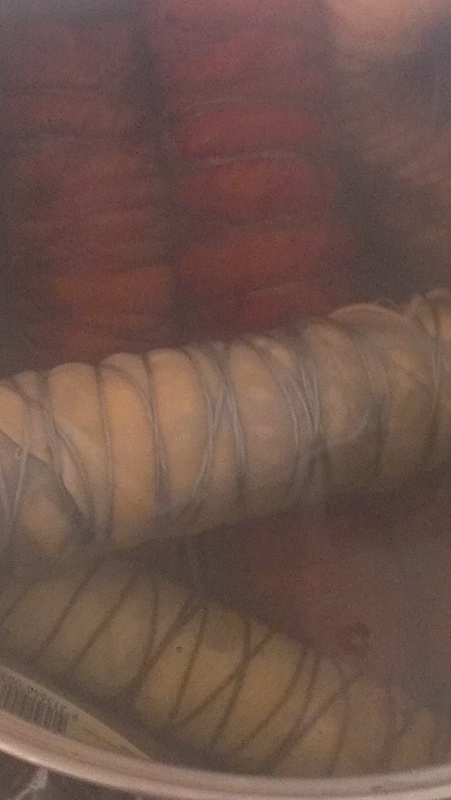 The first is a cold process suitable for protein fibres only, using vinegar. 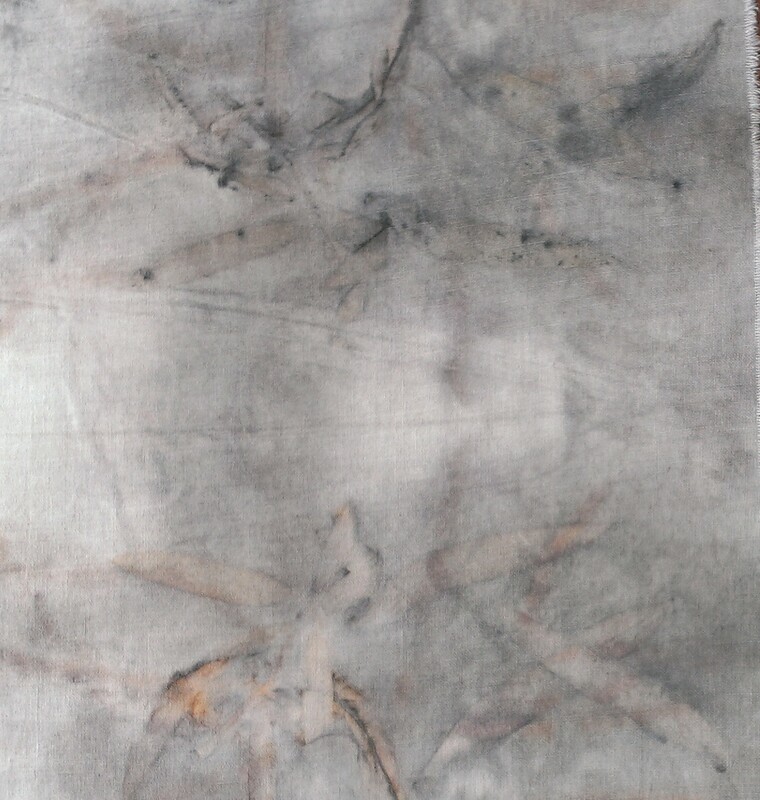 I have found it described online as a way to process Japanese Indigo to achieve turquoise by Dorothea Fischer and in a booklet by Helen Melville. 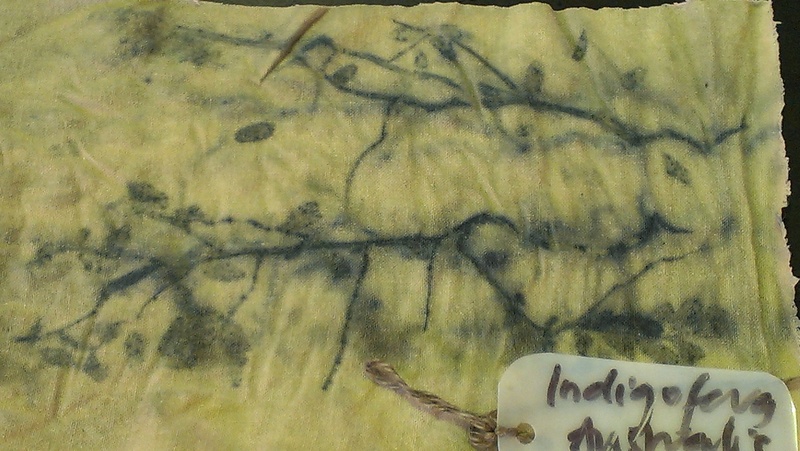 Japanese Indigo is a prohibited import and not available in Australia (no matter my feelings on the subject of Japanese Indigo as a dyestuff, this country does not need more weeds). It does seem logical that this method should work on other indigo bearing species, even if Austral Indigo bears a lower proportion of indigo! However, using the leaves fresh is a key element and my leaves weren’t as fresh as possible. 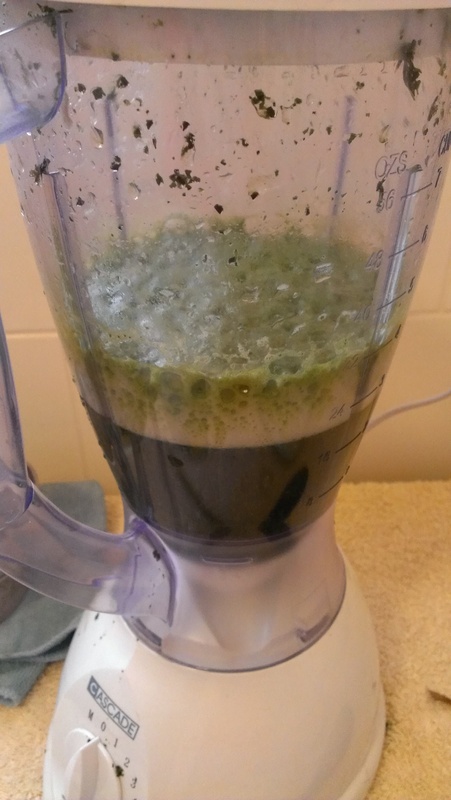 The water immediately went a vivid green, and so did the froth on top. I also tried dyeing some wool, but even after a lot of dips my little skein is barely blue. 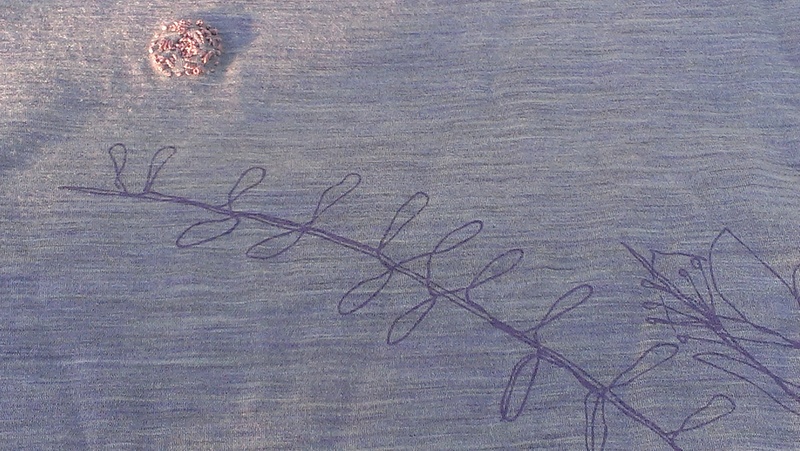 End yield: 2 lengths of blue silk thread, three lengths of grey-green-blue silk thread and some off-white-in-the-direction-of-blue-merino. 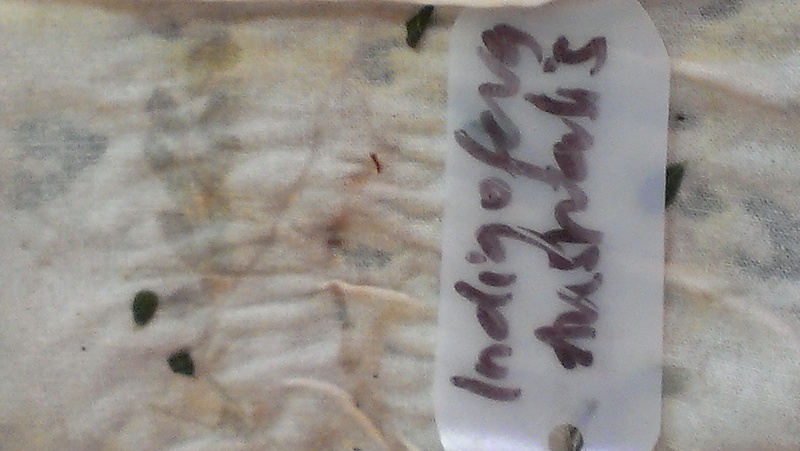 Clearly, as I had heard, Indigofera Australis is a low yielding source of indigo. 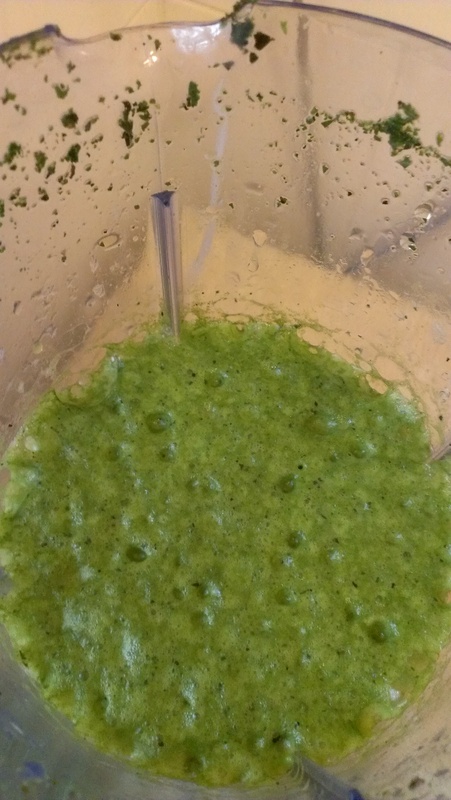 But this method was brilliantly simple, easy and non toxic. I will happily try it again when my plants are a little bigger. These trees were rather young and rather prostrate. 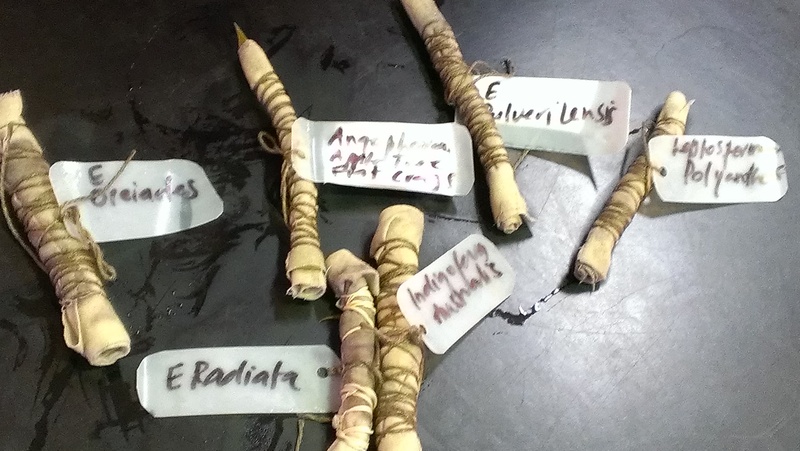 However, the fact that they were helpfully labelled made me feel I should take an interest! 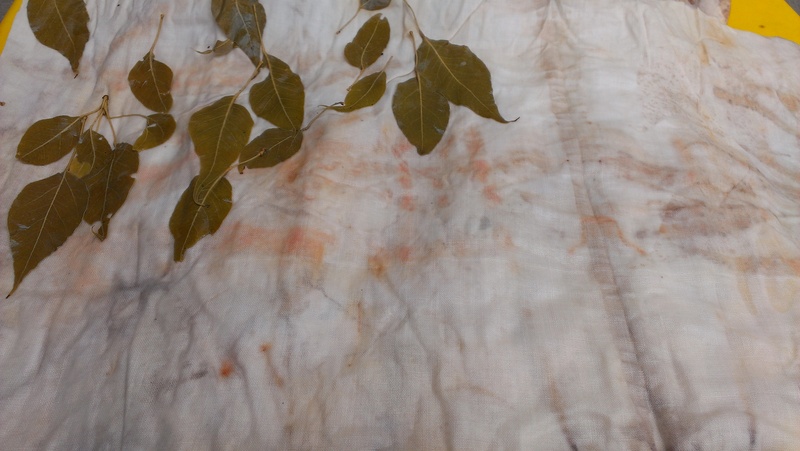 I took only a few leaves, which is one of the big advantages of the eco-print technique of assessing dye potential, as India Flint has emphasised. The grooves on the bud caps are rather lovely, I think. 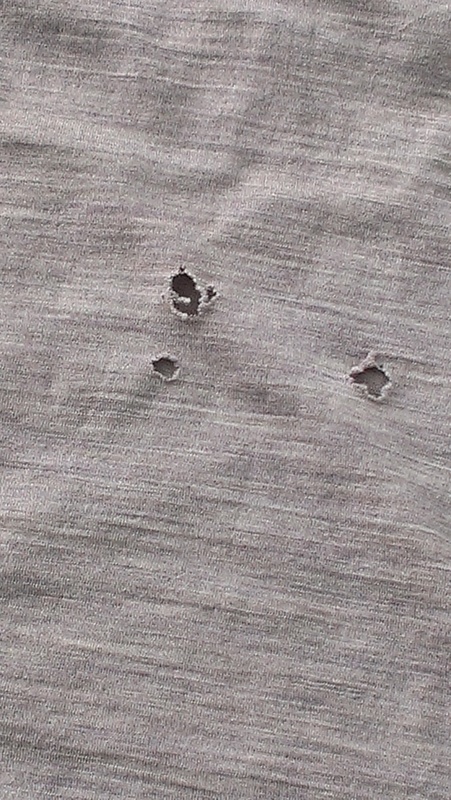 The sample print… not deeply exciting, even with some help from iron! 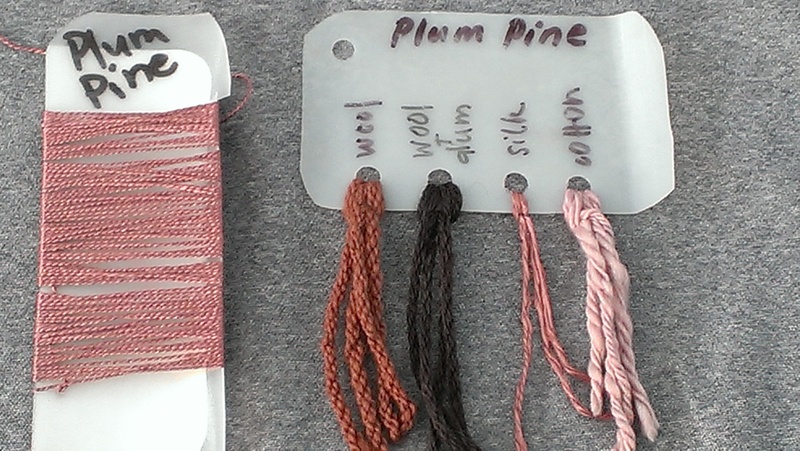 Plum Pine 3: Let the dyefastness testing begin! 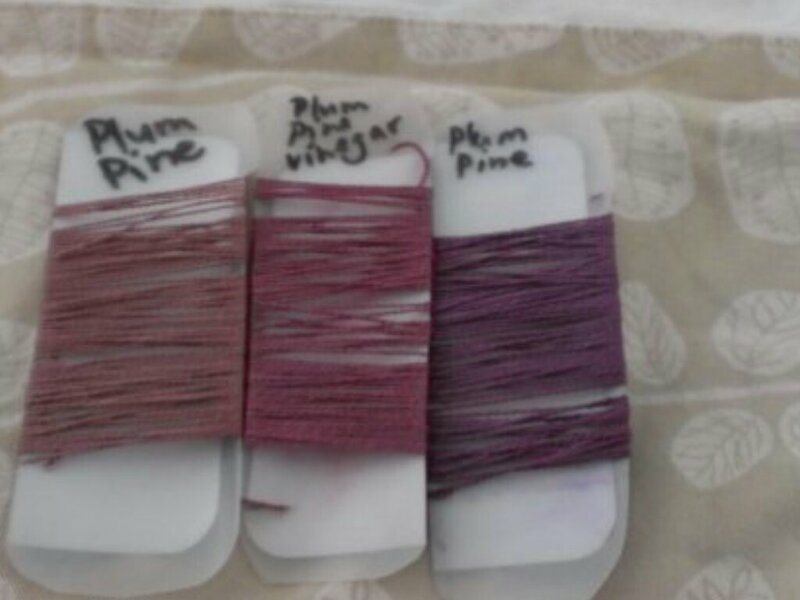 Unbelievably, the plum pine is still fruiting, and I am keen to dye enough to be able to do some wash and light-fastness tests in the year before it fruits next time. 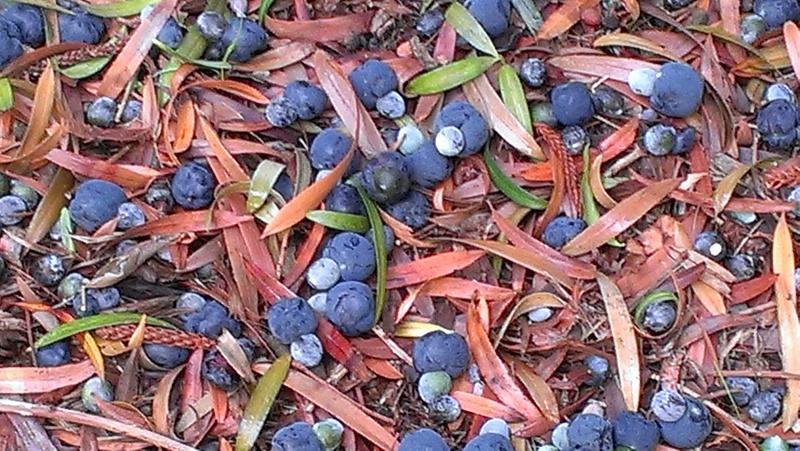 So I harvested again, picking up fallen ripe fruit from the ground until I filled the bags I had with me. A man in white overalls who seemed to be working nearby was gripped to see me doing this and asked me all about what I was doing and why. He was fully supportive of ‘making use of our natural resources’–as he put it–! 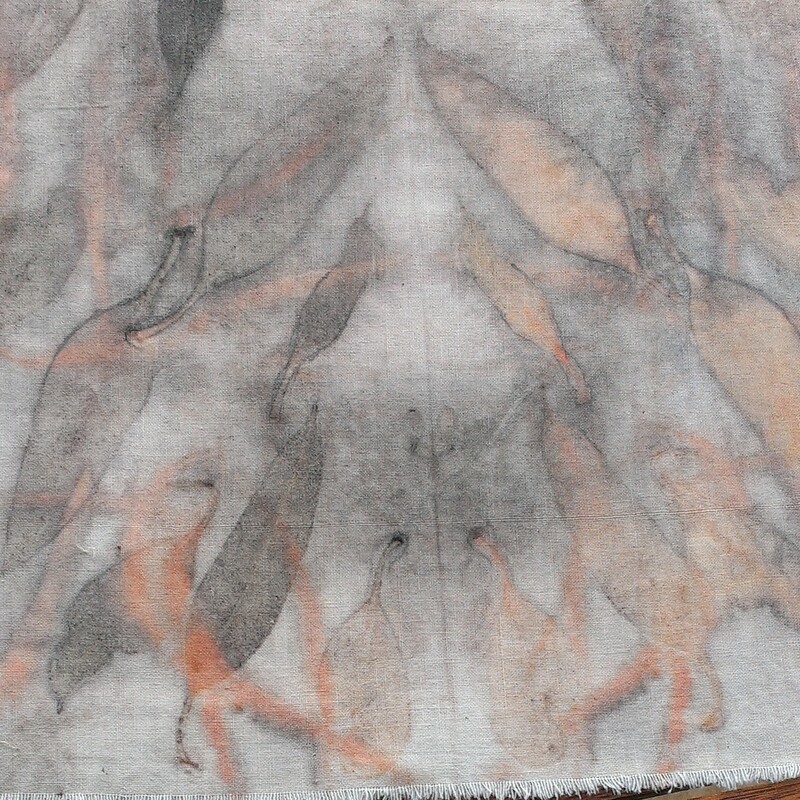 Early signs are that my silk threads dyed without alum will not be washfast. My mending has changed colour in only a couple of washes, and seems to be Ph sensitive, with pink without alum noticeably paler and purple with alum (the contrasting outermost ring on the right) turning blue in a mildly alkaline wash.
Only someone accustomed to dyeing with eucalypts, which are fast on wool and silk with no mordant, would think unmordanted yarns were a good beginning place. So, I’ve had a mordant bath on the hob. I did not have loads of anything much ready to mordant and dye except Bendigo Woollen Mills alpaca rich, so 200g of that hit the alum and cream of tartar bath along with smaller quantities of other yarns. After removing the seeds, I had 2650g of fruit. I was a bit gobsmacked by the quantity! Never one to shy away from a challenge, I put my fruit in a pot of rainwater with a cup of vinegar and simmered for an hour. Then, I entered some handspun wool, some commercial alpaca-wool blend and some silk thread and silk/cotton 70/30 thread, all mordanted in alum and cream of tartar. 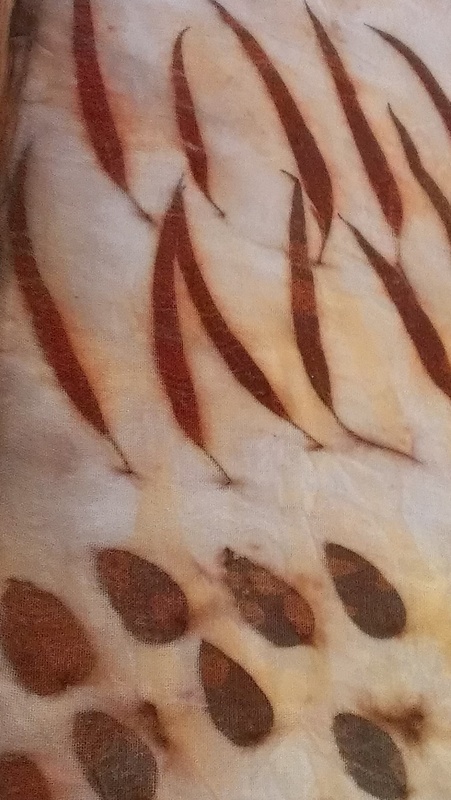 The colour takeup on the silk was dramatic and almost immediate! I simmered for another hour and then left overnight. The colour change overnight was again worth the wait. 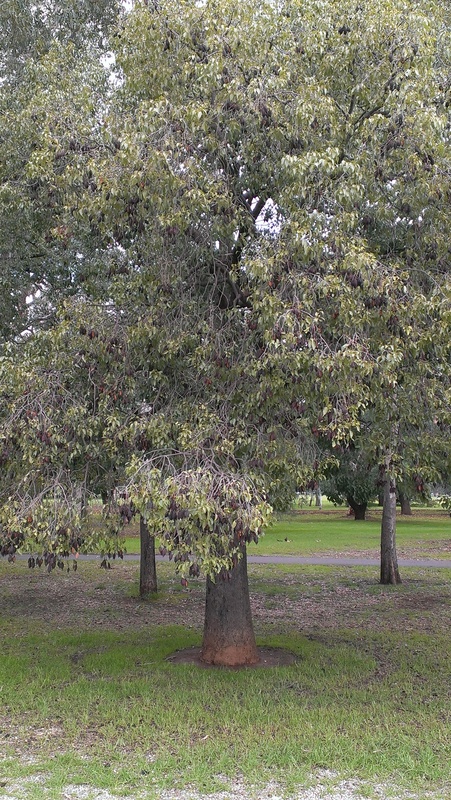 Kurrajong trees (Brachychiton spp) are in fruit in the parklands and suburbs. They are native to Australia, but not my part of it. The seeds are edible when roasted, but the fact that they come nestled into their little boat-shaped pods in a bed of irritating hairs puts a lot of people off (I’m one of those people)! We went for a run by Victoria Park Racecourse a few weeks back, and there were many. Some with glorious lichen-covered trunks. 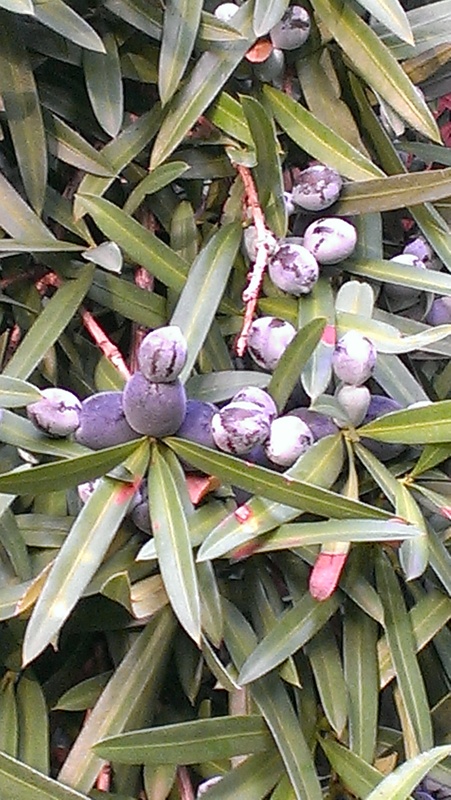 And evidence that it is not on the verge of becoming a world-renowned dye plant. 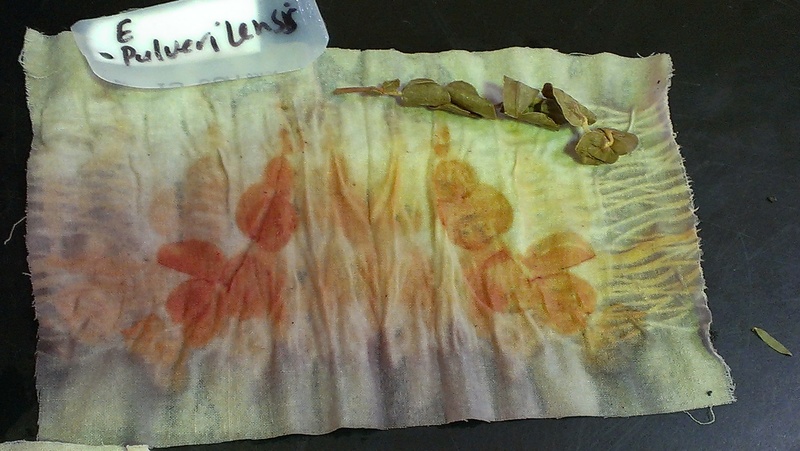 In this image you can see my test piece, with half the leaves removed from it. 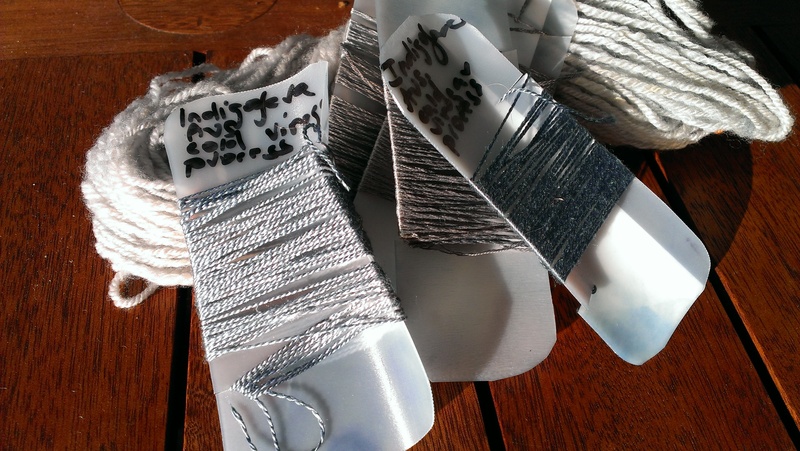 The smudges of colour you see have transferred through from other samples in the same bundle. 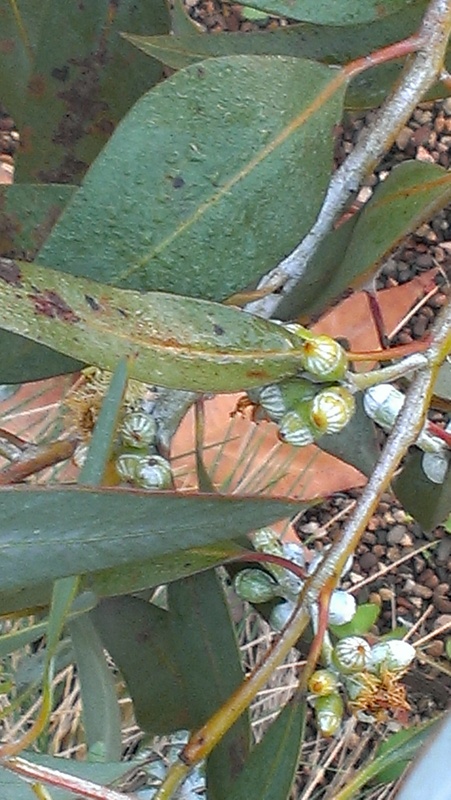 Nothing from the kurrajong leaves my beady eye could detect. 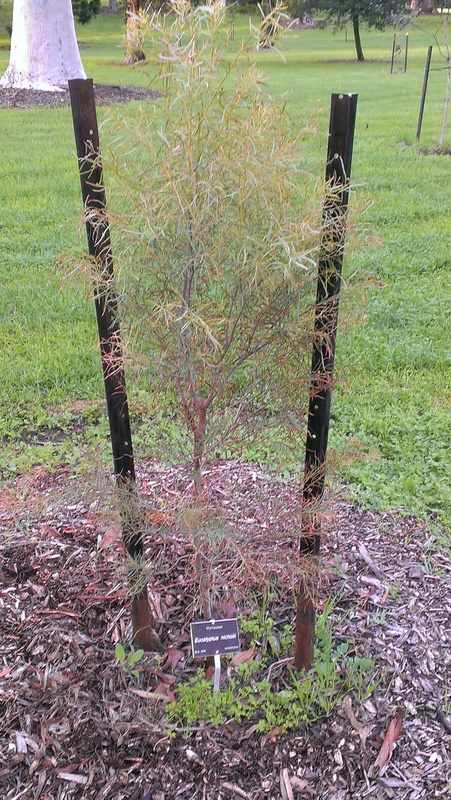 I finally found E Nicholii, growing in Botanic Park. My beady eyes have been searching the suburbs of my city for this tree as I ride past, to no avail until now. This is such a finely-leaved tree! 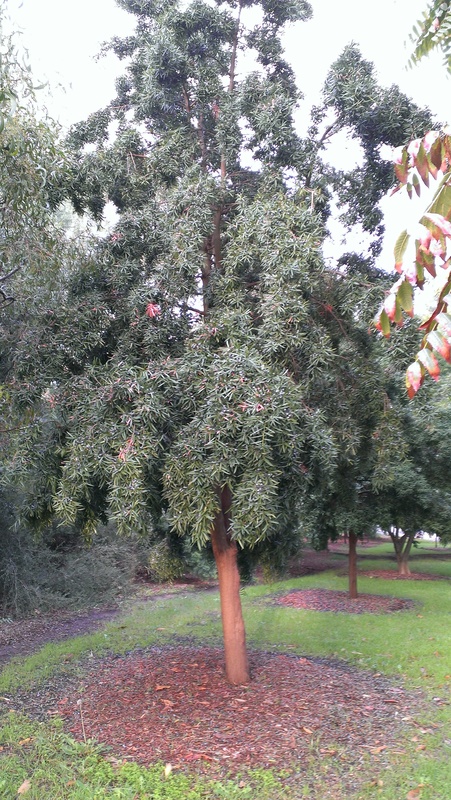 Perhaps I have failed to identify it if I have seen one fully grown, mistaking it for another kind of tree altogether. I had one growing in a pot but it suffered too much through summer. It is also the only tree I have ever seen as the subject of a public notice at Guild, where I once saw a hand lettered note asking if anyone could supply E Nicholii leaves for a dyer. 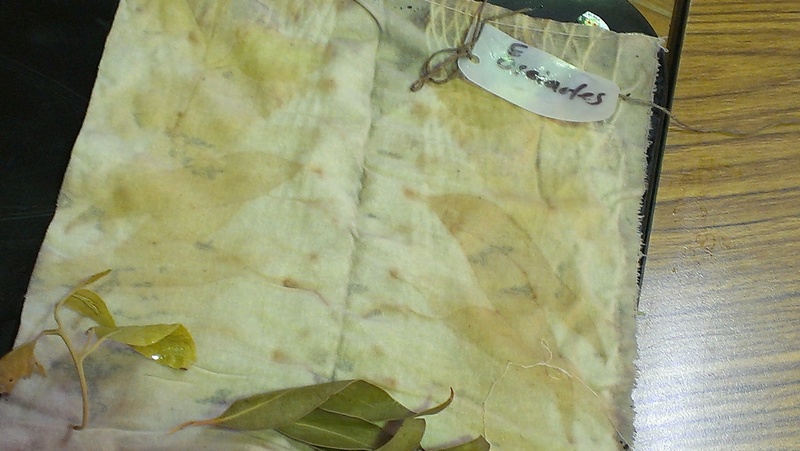 My friend’s godmother–another dyer–who lives in NSW, recommended E Nicholii as her favourite dye plant. These are some of the reasons I was trying to grow it in a pot. I have given that up and we have a tiny specimen growing in the corner of the back yard. And now–the reason why people are so keen! I think this print is sensational. 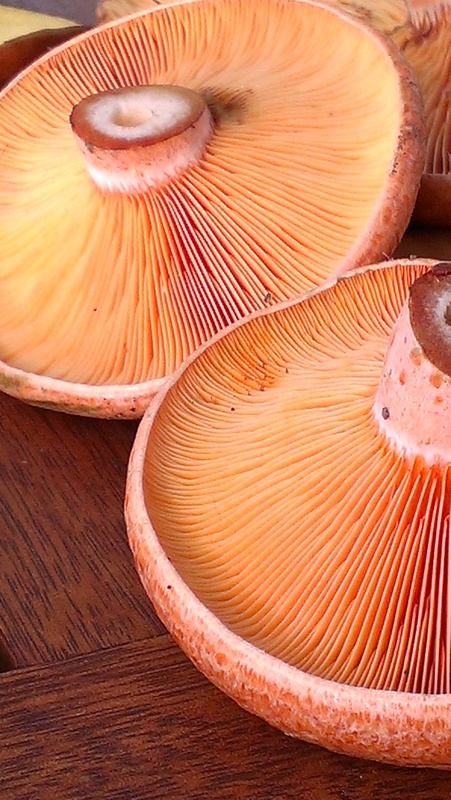 My neighbour brought round edible fungi, including Saffron Milk Caps (Lactarius deliciosus) to share with us. Such generosity! These are an introduced species often found in conjunction with pine forests. One was too large to be good eating, so into the dye pot it went, since its gills are so brilliantly orange–and even more so when cut or crushed. I could not find a reference to this fungus as a dye plant anywhere so can’t pretend to be surprised that my test cards showed almost no change at all. Perhaps a slightly more golden shade of white/cream. Still… that saffron milk cap was headed for compost in any case and just had a stop in the dye bath on the way there. Yes, we did eat them, fried in olive oil and garlic with parsley. Reviews ranged from ‘absolutely delicious!’ to ‘I’ll stick to the usual sort but they are OK’ at our dinner table. 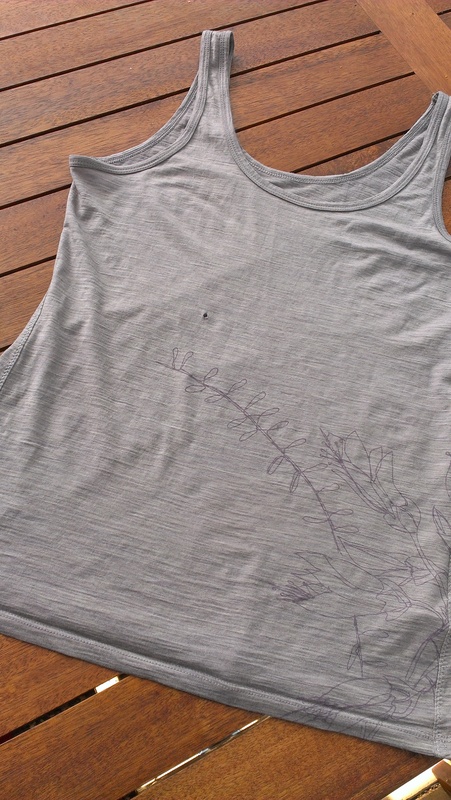 And a small cluster of holes on the back. I thought I might just leave them. This garment is not outerwear and surely they wouldn’t run too far. 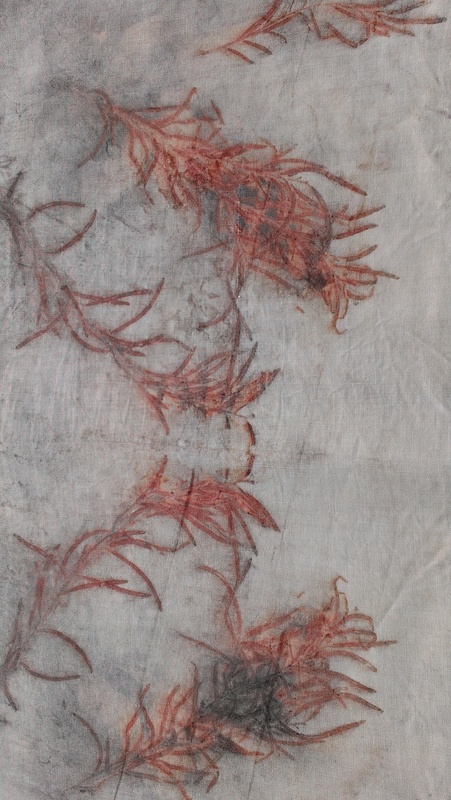 But then I thought of mending them with silk thread and overdyeing the whole garment in eucalyptus… and just when that was tickling my fancy, I dyed silk embroidery thread with Plum Pine and got colours that seemed like they might fit… and so I spent an evening working on my mending. Since the moths gave me circles (more or less), I worked with that theme. I’ve tried to leave a little extra thread at the outer edge of each part of the darn to accommodate stretch–which is what my Mum taught me to do when darning a sock. 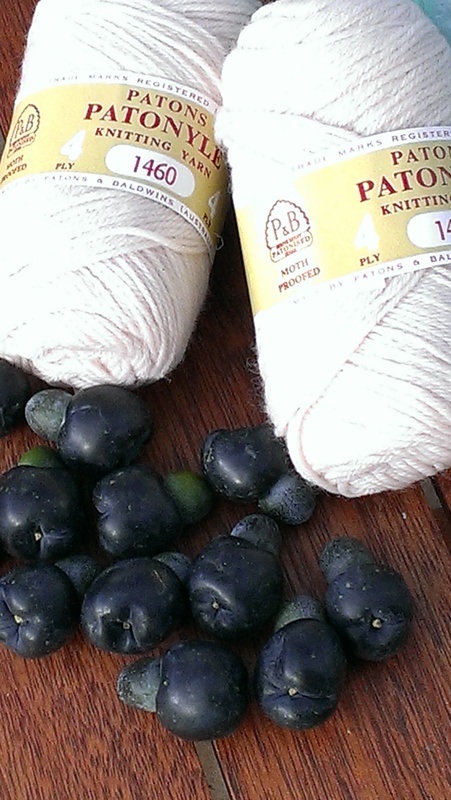 Having had success with a test dyebath, I made a point of returning to Botanic Park to collect more fruit on weekend, en route to celebrating World Wide Knit in Public Day. I dyed some grey corriedale locks in my test bath and they went from grey to a dull brownish shade, so I opted for superwash + alum and silk as the most likely candidates for success. I mordanted sock yarn of antiquity (picked up at a garage sale) and prepared another dyebath. I regard sock yarn as a no risk option. 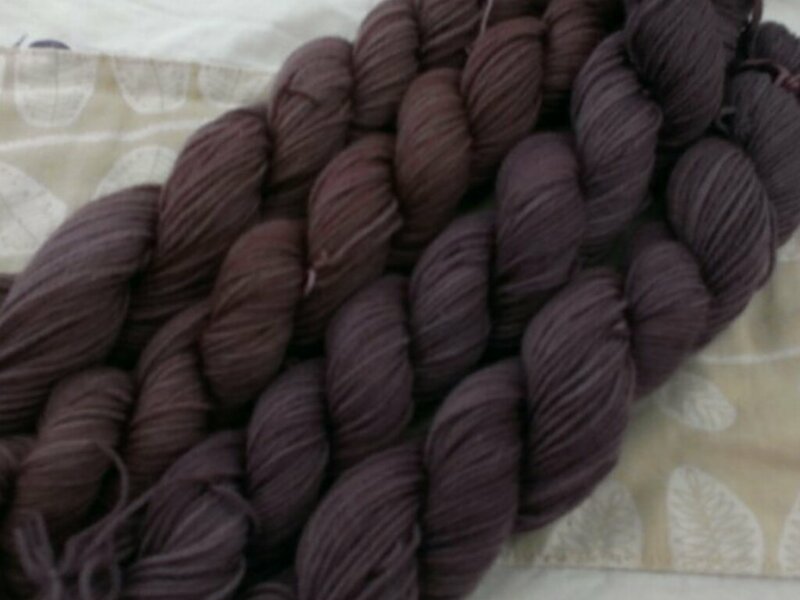 If I knit socks for a friend, I can make an open offer to re-dye at any point they fade to an unacceptable shade (and I can ask how they’re faring under normal wear and washing). The dye bath looked fantastic. I ran two baths with this fruit, because the first one produced purple on my alum mordanted skeins of sock yarn (wool-nylon). I pulled it out of the bath after dark and in artificial light it looked quite brown. So I dropped the skeins back in the bath for the night and put test samples into an iron bath and a vinegar bath. Next morning the sock yarn was purple! The exhaust dyebath was a lighter and browner shade of mauve. I apologise for these photos but it’s winter here and sunlight is in short supply. 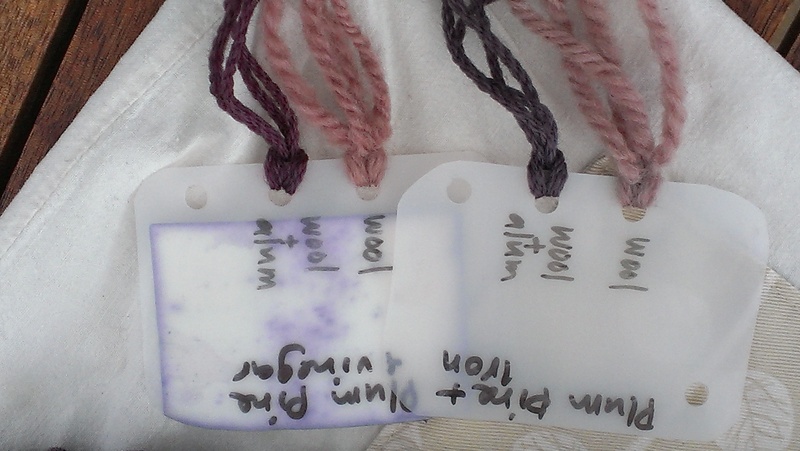 My tiny skeins of silk thread came out various shades of rose pink through to magenta too… and I have embarked on an embroidery project, so that was exciting. 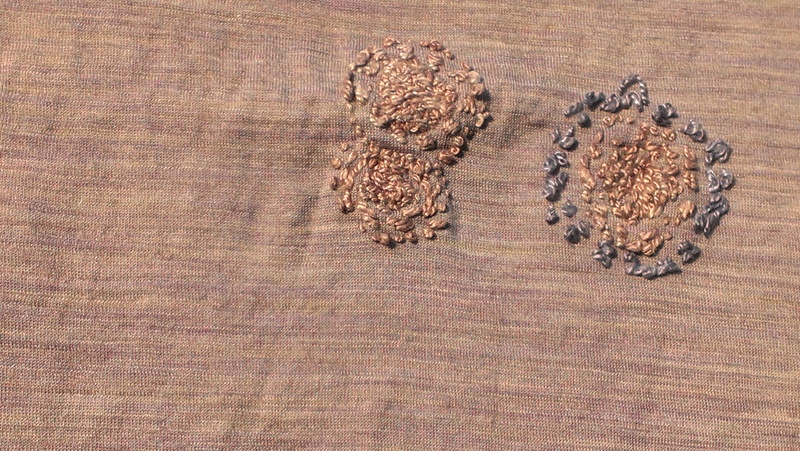 The shades on the right are both using vinegar in the dyebath. 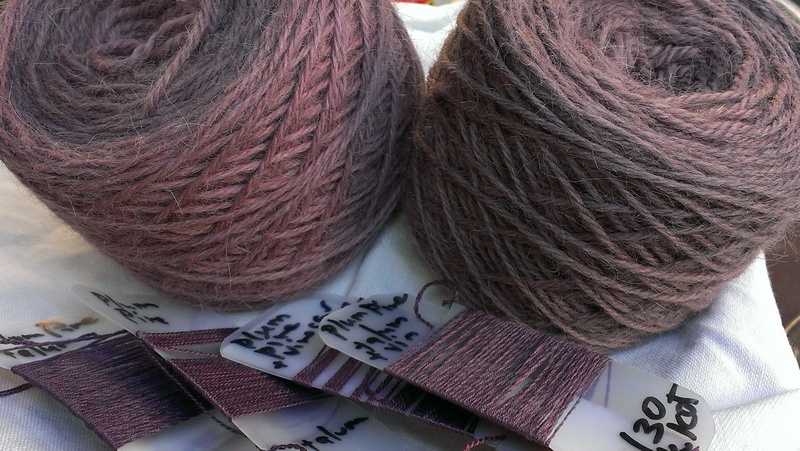 The modifiers were interesting: the wool+alum strand was noticeably more purple with vinegar and noticeably more brown/grey with iron, which is, I think, about what should be expected. So… a promising beginning to experiments with a new dye plant–but with no sense yet of how washfast or lightfast it might be. 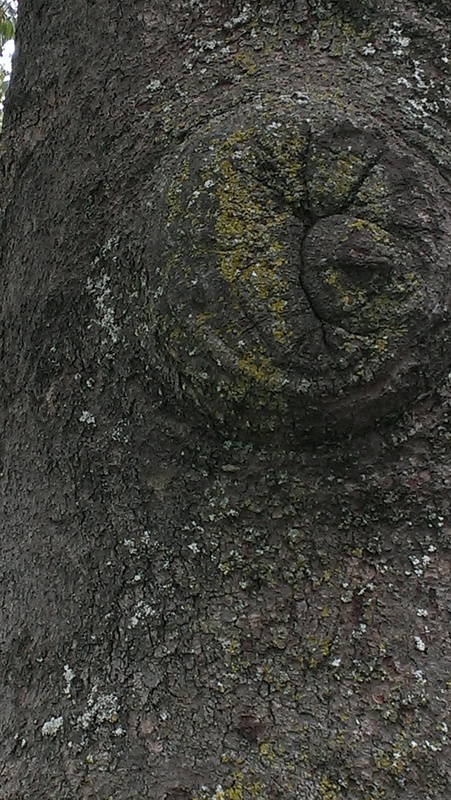 This is the tree itself. 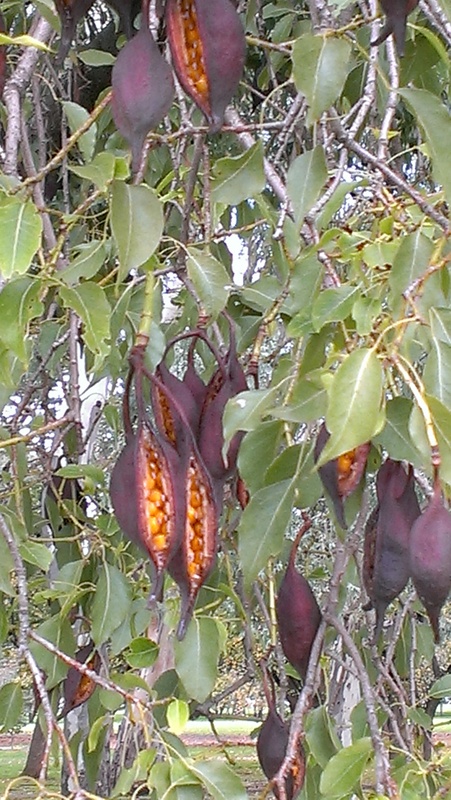 It is native to Australia, but it is a rainforest tree. For those who don’t know… I am not living anywhere near a rainforest. 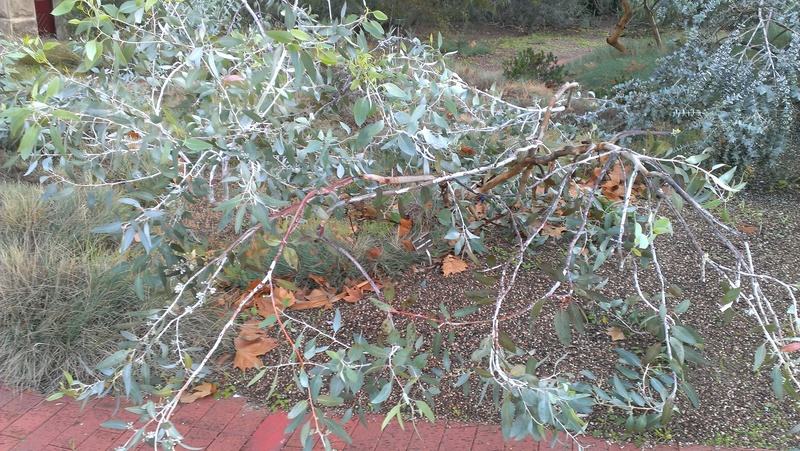 South Australia is generously described as having a Mediterranean climate. Those less generous just call it a desert, and a fair amount of the state answers that description. I tried eating one of the fruits and it was just as I remembered it from last time: subtle is the most I could say about the flavour, and the word ‘mucilaginous’ came to mind immediately. If there is a commercial application for this fruit perhaps it would be… lubricant. Or perhaps it could be the gumbo of Australian bush food desserts. I tried leaf prints… but nothing too exciting came of it. I twisted the seeds off the fruit and soaked the fruit overnight–pitting plums has never been so simple. No change in the colour of the water. 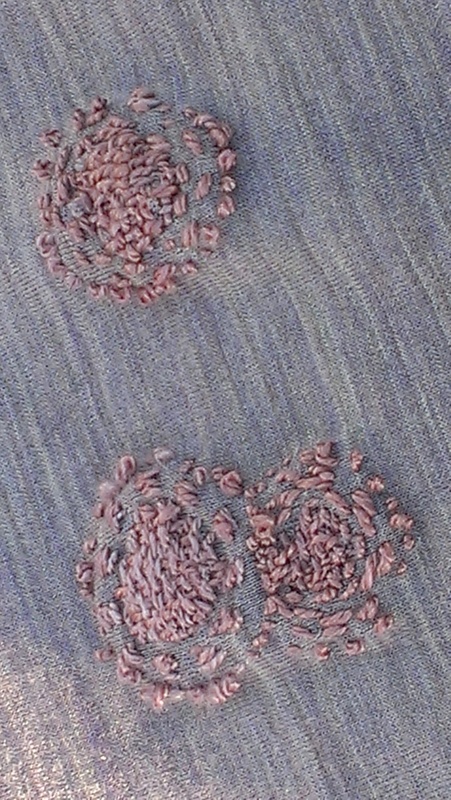 I cooked them for almost an hour–water a deep plum colour by now–and then threw in a sample card and some silk thread. 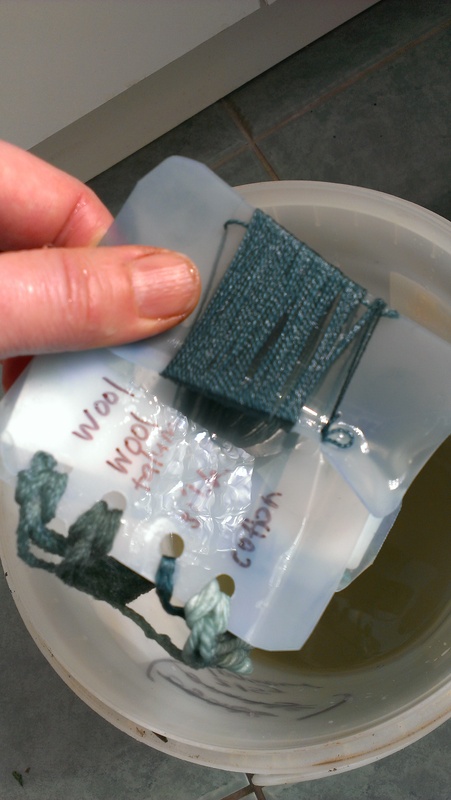 Soon after that, the alum mordanted wool looked almost blue, and the other fibres (cotton, silk, wool) looked pink. 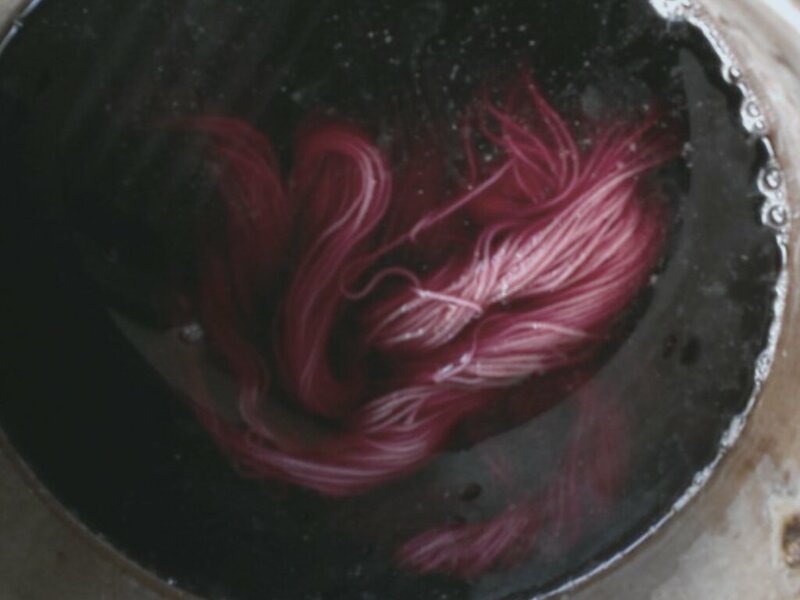 After about an hour of heat, the alum mordanted wool was deep grey-blue, the wool was deep rose-pink and the other fibres looked paler shades of pink.